Mounting Bases are an effective, versatile, and durable wire management mounting product for routing and securing wires and cables in place. These mounting bases are easy to install and are available in a variety of configurations for adherence to the mounting surface. 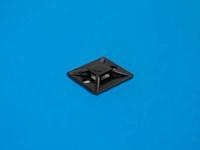 The most popular mounting base is square in shape with a rubber backed adhesive for mounting. The design also includes a screw hole located in the center of the base. 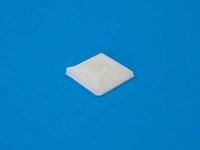 An acrylic backed base is recommended for applications requiring extra holding power or higher temperatures. Both the general purpose rubber backed and acrylic backed bases are available in Natural and Black. Sizes available include ¾”, 1”, and 1 ½”. The ¾” and 1” sizes are recommended for use with 18 lb – 50 lb cable ties. For heavy duty and extra heavy duty cable ties, the 1 ½” mount is recommended. An option with only a screw hole and no adhesive backing is also available. Packaging options include bulk bags of 1000 pieces or smaller bags of 100.